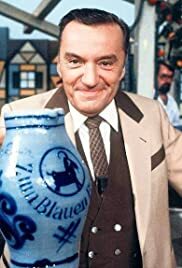 Zum Blauen Bock was an entertainment show by the Hessischer Rundfunk on German television. Watched the Comedy growing up as a child in Kiel Germany. Very hilarious comedy with a touch of a "Variety" due to the musical numbers. Had a Southern Bavarian flavor to the show. Watched the show on a neighbors TV set, since we were to poor to buy one. I was 7 years old and recall only 2 channels on German TV at that time. I have been attempting to find some copies of the shows for a video library that I constantly update.